Recently I was contacted by a fellow seaglass hunter, Marlisa, who shared with me her amazing haul from a recent vacation she took to one of the United States’ territories in the Caribbean. Check out her amazing finds! Ahhhhh, the desert. So quiet, so open. Being in the desert allows us the rare opportunity to simultaneously feel as if we understand the bigger picture of the universe, and at the same time feel so small and insignificant. I spent a decent amount of time in the deserts of California and Nevada as I worked my way through a B.S. in Geology. Even though I received my degree from a Northern California University, we always traveled to the desert for our field research. It's just easier to see the rocks when there is little to no vegetation covering it. My most recent trip to the Mojave was compliments of an invitation by one of my past professors. It's a place I have been a few times before, a special little retreat nestled between two rocky outcrops. For purposes of preservation of this beautiful land, I won't divulge the exact location. But I can tell you it is in the Mojave desert near some old mining camps (yeah, I know this could be anywhere, that's the point of being vague). While on my past trips to this location I had been consumed with mapping and rock/mineral identification in the interest of scholastic advancement, this time I was free to roam. And I new exactly where I wanted to go. I'm a treasure hunter. Usually my treasure is found in the surf and on the beach. I'm talking, of course, about seaglass! But there is treasure to be had in the desert as well. Back in the early 1900s, parts of the Mojave were mined for silver ore and talc (among a few others). And with mining and mining camps comes trash... really old trash. And that's what I was after. I love finding old poison bottles and coke bottles. Unfortunately we didn't find any intact. But we did find lots of broken pieces and shards. One such pile of glass looked as if all the pieces might still be there, a shattered array of cobalt blues. I collected them all in the hopes of maybe putting this puzzle back together. Alas, I was missing several pieces but I did have enough to make a possible comparison with a bottle I found on the internet. The pieces I found were most likely that of an old cobalt poison bottle that might have stood about four inches tall and had ribbing on the back with a flat surface on the front for a paper label. To my delight I also found a abundance of purple glass! 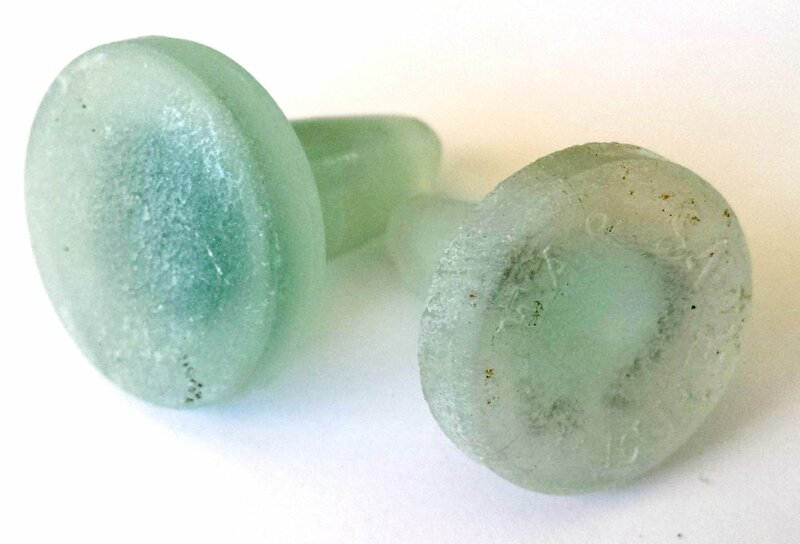 As mentioned in a previous blog about seaglass color rarity, the purpling of older glass is the result of the magnesium dioxide added to the glass when it is made. Exposure to sunlight and ultraviolet rays over a long period of time causes the magnesium dioxide to turn the glass purple (via chemistry I don't understand). One of the larger purples I found looks like it might have been an insulator at one point. Either that or the base of a large bottle. But my money is on insulator. 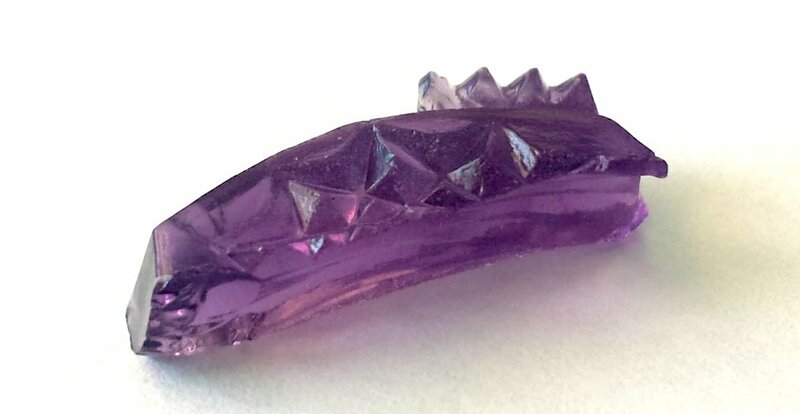 Smaller pieces of purple that were found had ornate embellishments. I haven't yet been able to identify what type of container they may have come from. Large seafoam pieces were also found, and man are they thick! A few pieces had more detail on them; decoration for the bottle. But the pièce de résistance were the two bottle stoppers that we found! Go figure! I've been trying to find a bottle stopper for years, and I had to go all the way out to the middle of nowhere to find them! One even had old lettering on it; Lea & Perrins. Turns out this company is still in business making worcestershire sauce, lol. But the stoppers we found are probably from the late 1800s - early 1900s. Here's a fun fact: Lea & Perrins is the is the oldest commercially bottled condiment in the U.S. It was such a wonderful getaway, and I can't wait to go back. The desert has always been a refuge for me. I used to call it my ocean of sand. The detritus that comes off the mountains creates a sea of alluvium, and I just love getting swept away in it. Russian glass beach? Yeah, I believe it. I mean c'mon, vodka capital of the world am I right? Those bottles had to end up somewhere, and since they didn't end up in a recycling plant they ended up in Ussuri Bay near the naval port of Vladivostock.